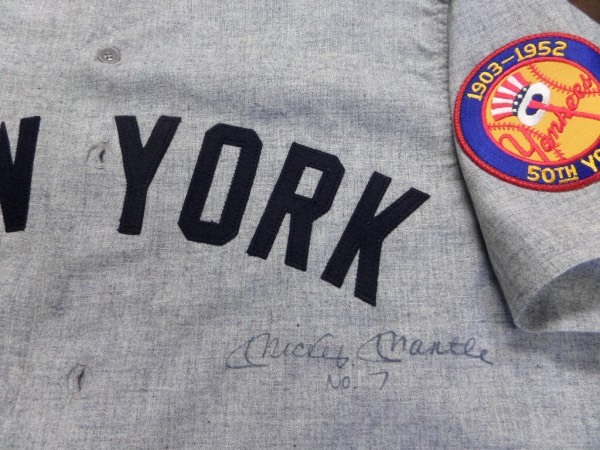 Coach's Corner - Mickey Mantle hand signed/guaranteed Yankees Game jersey. Go Back to Lot List Mickey Mantle hand signed/guaranteed Yankees Game jersey. This mint road grey is a 1950's styled throwback and trimmed in team blue. It has the 1952 patch intact, sewn on everything as well as his #7 on back, and comes IN PERSON signed by the Mick across the front. It is a tad light as signed 30 years ago, but Lee approved it real forever, and he has even written his No. 7 as a bonus. It is an original Mitchell & Ness, not a cheap China knockoff and value is many times our asking price.